With negative fan reactions as intense as they are, what happens when a localization isn't liked or, worse still, doesn't happen at all? Oftentimes, the fans do it themselves. The first landmark translation was in 1993 with SD Snatcher on the MSX, by a Dutch group called Oasis who sold the work at MSX fairs. Years later, the rallying cry for internet-based groups became "FFV!" which led to a scene explosion and countless translation patches, even on systems like the Saturn and PlayStation 2. While these are scattered across the internet, many are collected on sites dedicated to ROM hacks. Professional reactions to fan work are mixed, notes Woolsey: "I've been amazed. Some have been quite good, done by sharp people who know Japanese and how to write. Some have been almost comical. I recall one site, with some fairly vocal contributors, who were advocating translating using Japanese grammar (subject, object, verb). 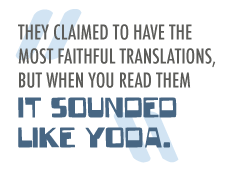 They claimed to have the most faithful translations, but when you read them it sounded like Yoda." Even so, Blaustein also says that professionals can benefit from the fan community's work. "One of the most shocking things in my career has been to see the extent to which fans go. On any number of occasions I've been given the task to translate a game, I've gone on the internet to gather my research, and how many times do I find that a fan has already played the Japanese game, done a translation and put up JPEGs of everything? It's absolutely frightening, because they will spend more time than I am allowed for the official translation. Sometimes I may even use their website, because if it's a series, and I jump in at two or three, I need to go back and learn the series' history. Phoenix Wright is a perfect example. I relied on this incredible fansite where he showed items - I needed to know, when translating, what does that thing look like? I'll find out things[from sites] that the client should have told me." With the resurgence of classic games via download services like the Wii's Virtual Console and the PlayStation Network, it raises the question of whether fan translations are harming the possible release of previous Japan-only titles. A few have come out, but why aren't more available? The consensus among publishers was that it comes down to expense. "The juice has to be worth the squeeze," admits Swartz. "It's certainly possible to localize games for download. There's no inherent reason why it couldn't be done. But it goes without saying that a good localization is an expensive, time-consuming operation, and if you haven't seen a lot of it yet, it's because the business doesn't make sense." Blaustein offers an idealistic solution; "It's cost prohibitive ... but nothing would lend itself better to input from the fan community. It's perfect! Have contests; harness the power of the fans who would do it happily." Some might argue, however, that fan translations are no longer needed - that this is the golden age of localization. So what does the future hold, then, with growing budgets and an increasing divide as Japan becomes isolated through Western developers' success? Swartz is optimistic: "There's no doubt the Japanese industry is in decline - it's both consolidated and shrunk, so there's fewer games in total, and games are coming from fewer publishers. So the industry is definitely getting more American- and more European-centric. [But] there are teams and groups that put a lot of effort into it. The bigger companies routinely produce wonderful localizations. I think overall as games have moved more and more mainstream, quality has gone up, and really good localizations have gone from being pretty rare to being pretty common. These are interesting times." John Szczepaniak is a South African-born copy editor for a Time Warner subsidiary. Currently he's disappointed no one is localizing Yuusha no Kuse ni Namaiki or Ryu ga Gotoku Kenzan.